This day can be a day of building and renewal, added vitality and holiness. And although it fell on Sunday this year, the message is just as timely every day of the year. 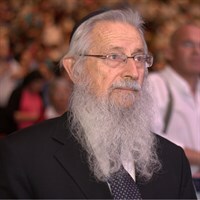 Rabbi Zalman Baruch Melamed is Chief Rabbi of Beit El, as well as the Rosh Yeshiva and Dean of the Beit El Yeshiva Center Institutions. 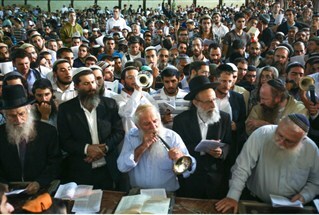 Rabbi Melamed is also Chairman of the Rabbis Council of Judea, Samaria, and Gaza. The Fast of Gedaliah is one of the four fasts that our Talmudic Sages and the Prophets laid down as memorial days commemorating the destruction of the Holy Temple, the destruction of our people and its holiest site. A fast was declared for every stage of the destruction of Jewish independence in Eretz Yisrael. On the Tenth of Tevet , the King of Babylon turned to the conquest of Jerusalem and laid a siege on the city; on the Seventeenth of Tammuz the wall was breached, the wall of the city of Jerusalem; on the Ninth of Av the Temple was destroyed; and on the First of Tishrei, Gedaliah was murdered and the last vestige left of Jewish governance in Israel dissolved, completing the destruction. After the King of Babylon destroyed the Holy Temple and Jerusalem, there had still been a small number of Jews in Judea over whom he had placed his subordinate Gedaliah ben Akhikam and Jews had begun returning from the nearby lands to which they had fled, happy to dwell under Gedaliah's governance. It was a small group that thus survived in the land, but on the first of Tishrei, when Yishmael ben Netanya came and murdered Gedaliah ben Akhikam, that small vestige of remaining Jews scattered and the destruction became total. Our Sages said (Tractate Rosh Hashana 18) that this day is a memorial fast for Gedaliah's murder, the same way the day of the destruction of the Temple is a memorial fast, "to teach you that the death of the righteous is equal to the burning of the House of G-d". And, of course, so it is with this righteous man's death, this man who was the pillar of strength for the Jewish remnant that had stayed or returned to the land. The fact that a Jew murdered Gedaliah, that a Jew destroyed the last vestige of Jewish existence in the Land of Israel, deepens the measure of the destruction; and this occurred in the midst of the days of repentance, during the Ten Days of Repentance that end on Yom Kippur. These are days of tikkun, of self-improvement, and when this is not forthcoming, as was then, this day becomes the pinnacle of ruin. But there is always room to do tikkun and it is exactly this day that can change into a day of construction, added vitality, renewal and holiness. May it be G-d's Will that this is the year of Redemption and Salvation, that the light of Torah and faith shine on all of Israel.